FONLAD – Online Festival for Digital Arts is an event co-organized by the Cultural Association IC Zero and the Videolab project, completing in 2015 ten years.It is intended to promote the digital productions of several artists who approach the new technologies in contemporary art. The Online Festival for Digital Arts will take place online between January and December 2015 showing video art and video installations in unconventional places will also be carried out to define timely. When the sad situation in the north eastern part of Nigeria; Baga happened, many were peeved that it didn’t get as much publicity in the press or other media as compared to the Charlie Hebdo case or others. But, what about the Nigerian and big African press houses? What about the majority of people who live near Baga and breathe down the gun barrels of the Boko Haram and know they could also be attacked next? Shouldn’t they protest, or shouldn’t there be an up-rise of some sort to show there’s bloody anger seeping from their eyes to see “Boko Haram just used a 10-year old girl as a bomb detonator and massacred up to 2000 others” in the headlines and their government is doing almost nothing while election period is near? Is it because people today are so self-absorbed, distracted by technology and overworked that in general there’s a tendency that we may feel bad for people in dire situations but we really don’t care enough to do anything? Is it because we live in an unequal world where people haven’t raised their consciousness high enough to embrace a “brotherhood of man” and realize what is truth and what is not? Do our evolutionists friends still think humankind is evolving? Or is this evidence to the contrary? By the way, let me go on to the main reason for this post. Two contemporary artists are worthy of note; Olanrewaju Tejuoso from Nigeria and Attukwei of Ghana because their works delicately sublimate the recent massacre at Baga- very symbolic expressions depicting the about 2000 villagers executed by Boko Haram terrorists. In “Disturbing the Peace” Vaclav Havel writes; “Every work of art points somewhere beyond itself; it transcends itself and its author; it creates a special force field around itself that moves the human mind and the human nervous system.” True, works of arts which are in connection to situations of trauma go to trigger a ricochet of emotions. Talk of emotions, Horowitz breaks it down better; “our emotions alert us that something is out of kilter, not right, not what we want. They are our sensitive “mental radar”. We perceive the experience of our feelings through our minds but because every separate emotion evokes a specific pattern of response in the autonomic nervous system, every emotion radiates an effect throughout every organ in our body. Every language, in fact, has dozens of expressions for emotions that are expressed in physical terms – “a lump in the throat”, “a broken heart”, “bowels in an uproar”, “a sickening feeling”. Burnt plastic canisters and sand installation. Not once but always, people identify writers with characters in their literature and bash them as such. Even more serious is the likelihood for a writer’s story about their place of origin to be misconstrued in connection with the collective as aligned to the concept. “Our lives, our cultures, are composed of many overlapping stories”. I was invited to the Meltwater Entrepreneurial School of Technology in Accra to do a guest lecture on storytelling and Chimamanda’s work about the dangers of a single story was a very viable source of information for the notes I shared. I named the lecture ‘storytelling and the ideas market.’ and connected the importance of telling one’s story as a creative or digital entrepreneur using the format of the spoken word or oral traditional style and the emotional connection to potential clients in the world of ideas and concepts. When the Cable News Network (CNN) presented its list of the most inspiring women of 2014 and two Nigerians, author, Chimamanda Ngozi Adichie and Dr Stella Ameyo Adadevoh; the Nigerian doctor who died last year after overseeing the treatment of Ebola patient Patrick Sawyer, made the list. UP CLOSE: GET TO KNOW THE BLOOD DRUM SPIRIT ENSEMBLE! 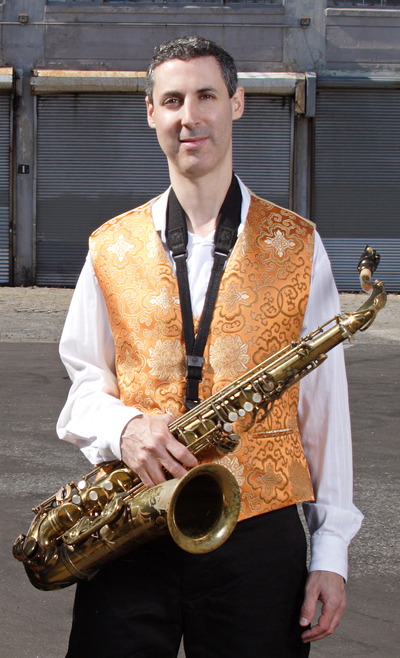 David Bindman, saxophonist and composer, leads his ensemble, and is a member of Blood Drum Spirit, and has performed with numerous artists and groups, including Wadada Leo Smith, royal hartigan, Kevin Norton, Ehran Elisha, Adam Lane, Anthony Braxton, and Talking Drums. 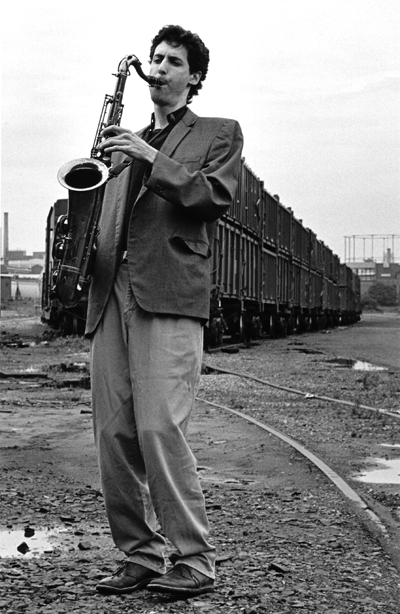 He co-founded the Brooklyn Sax Quartet with Fred Ho, recording the critically acclaimed CDs The Way of the Saxophone and Far Side of Here, and collaborated with poet Tyrone Henderson and visual artist Quimetta Perle, creating the multimedia pieces “The Madman” and “Strawman Dance.” The David Bindman Ensemble’s double CD Sunset Park Polyphony was released in 2012. Bindman lives in Sunset Park, Brooklyn. Wes Brown is a bassist, flutist, pianist, drummer, and dancer who has toured the world with many groups, including the legendary pianist Earl ‘Fatha’ Hines, Talking Drums, Anthony Braxton, and the Black Rebels reggae ensemble. 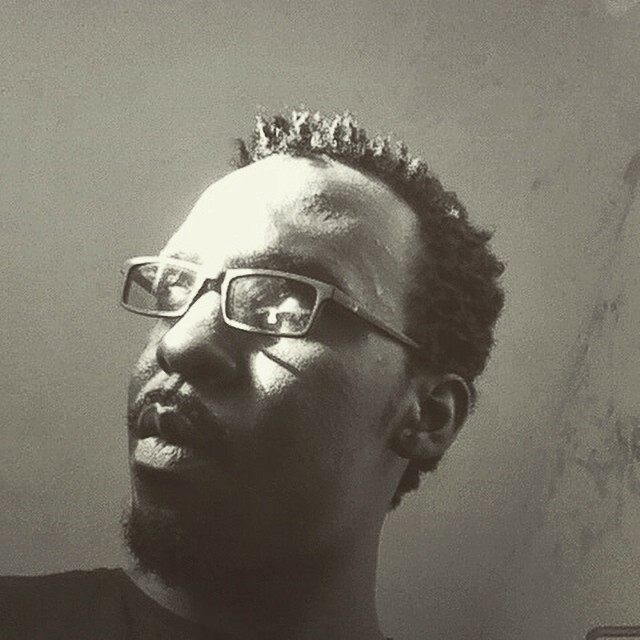 His musical expertise includes Jazz, Afro-pop, highlife, reggae, blues, and gospel styles. Wes has appeared on over two-dozen records with various artists, and currently teaches contrabass and directs the Gospel Choir in the UMass Dartmouth Music Department. 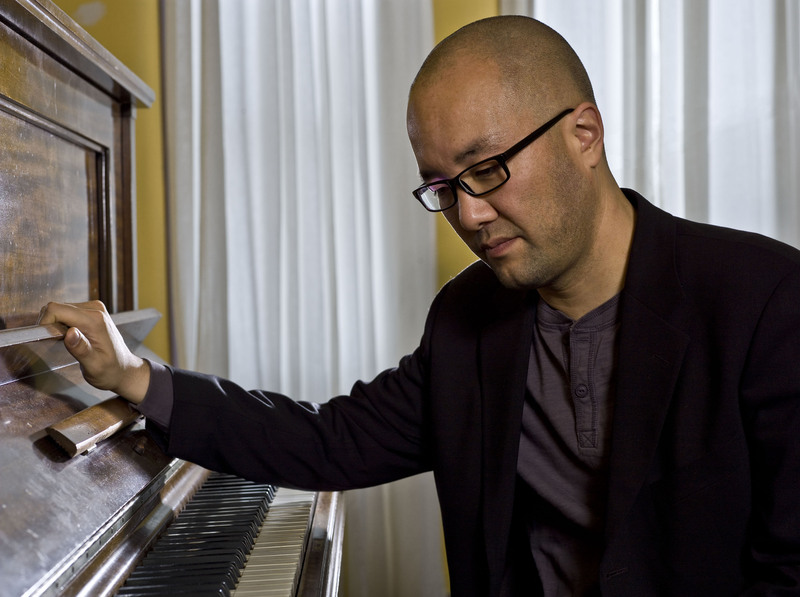 Art Hirahara is a jazz pianist/composer, originally from the San Francisco Bay Area, now residing in Brooklyn, New York. He received his Master of Fine Arts degree in jazz piano performance at California Institute of the Arts in Valencia, CA and a Bachelor of Music degree in Electronic and Computer Music from the Oberlin College Conservatory in Oberlin, OH. In 1996 he was selected by the U.S. Information Agency to serve as a “Jazz Ambassador” on a seven-week tour in Qatar, Yemen, Pakistan, Nepal, Sri Lanka, Oman, Kuwait and Saudi Arabia, where he performed, lectured and conducted workshops with local musicians. 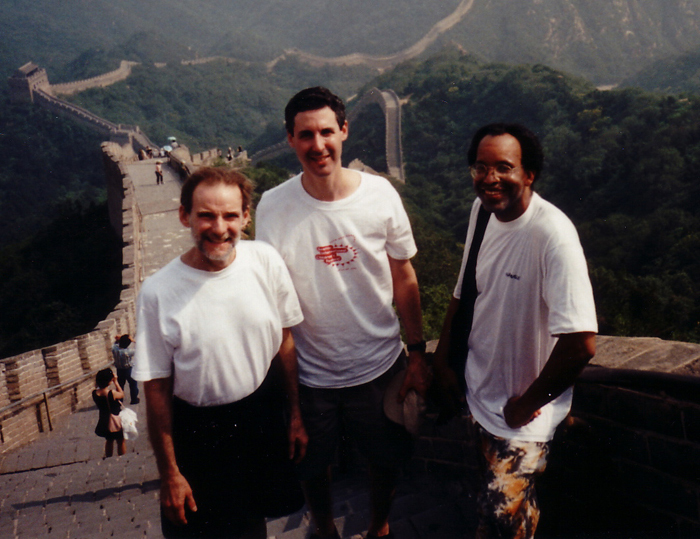 Art performs across the globe with many leading jazz soloists and ensembles, and has performed regularly at venues on the East and West coasts, including Yoshi’s in Oakland, CA, and Birdland in New York City, working with noted musicians including Vincent Herring, Akira Tana, Rufus Reid, Wadada Leo Smith, Scott Amendola, Todd Sickafoose, Hafez Modirzadeh, Anton Schwartz, Marcus Shelby, Anthony Brown and the Asian American Orchestra, E.W. Wainwright, Eric Crystal, Bob Kenmotsu, Chuck Sher, San Jose Taiko, Idris Ackamoor, and Helcio Milito. Barbera, Neal Creque, Jimmy Owens, Wadada Leo Smith, and David Roitstein. He was recently chosen as musical director for a new Off-Broadway show in New York. His CD entitled Edge of This Earth was released in August of 2000, followed by Noble Path in 2011. Royal Hartigan is a percussionist, pianist, and tap dancer who has studied and performed the musics of Asia, Africa, Europe, West Asia, and the Americas as well as African American blues, gospel, funk, hip-hop, and jazz traditions. He was awarded an A.B. in philosophy from St. Michael’s College in 1968, a BA in African American Music with honors from UMass Amherst, and M.A. and PhD degrees in world music and ethnomusicology at Wesleyan University in 1983 and 1986, studying intensively with ethnomusicologist David McAllester and Bill Lowe, Bill Barron, Edward Blackwell, Freeman Kwadzo Donkor, Abraham Kobena Adzenyah, and other master artists/scholars from Java, India, and Ghana, West Africa. Royal has received many awards for global research, performance, and teaching. These include Healey and Whiting Award (2010), Asian Cultural Council Research Grant for the Philippines (2009), a J. William Fulbright Lecture/Research Award for the Philippines (2006), a New School University (NY) Dean’s Resident Master Artist Award (2005-06), and a Korean Foundation Fellowship (2001). He is an endorsee for Vic Firth Sticks and Mallets, Istanbul Cymbals, and Remo drumheads. Royal has taught ethnomusicology, African drumming, and world music ensemble at the New School University (formerly the New School for Social Research) in New York, Wesleyan University’s Graduate Liberal Studies program, San Jose State University, and is currently a full Professor at UMass Dartmouth. His publications include Blood Drum Spirit: Drum Languages of West Africa, African America, Native America, Central Java, and South India, a 1700-page analysis of world drumming traditions (UMI/ProQuest); articles in Percussive Notes, World of Music, Annual Review of Jazz Studies, Music in China, and The African American Review; a book with compact disc, West African Rhythms for Drumset (Manhattan Music/Warner Brothers/Alfred 1995, 2004), named one of the top 25 percussion books in the history percussion publications by Modern Drummer Magazine, and two with digital video disc, Dancing on the Time (Tapspace 2006), and West African Eve Rhythms for Drumset (Print Tech 2011). 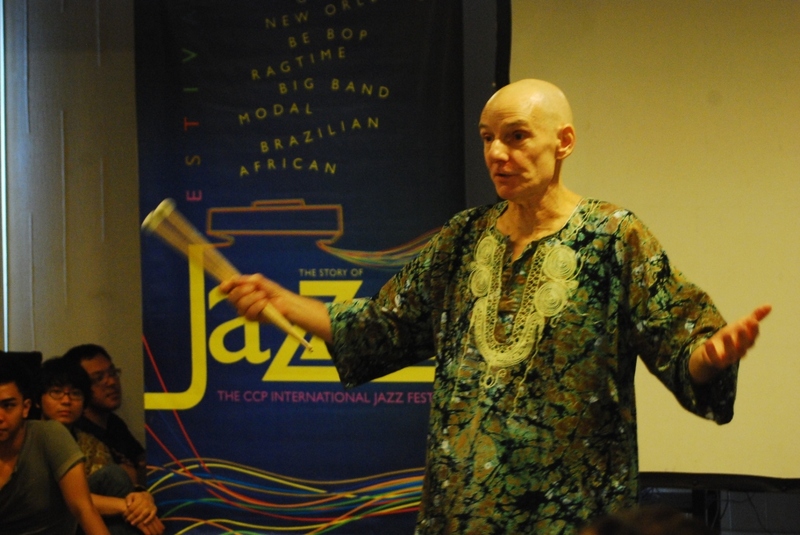 He has given lectures and clinics on world music and jazz in Africa, China, the Philippines, Europe, and North America. Royal travels to West Africa most summers to teach, perform, and do research, collaborating with master artists and the people of various villages, including the Dagbe Cultural Centre at Kopeyia Village, Volta Region, Ghana, the Dagara Music Centre in Midie, Ghana, and Mampong, Asante Region, Ghana. He was a Visiting Professor at the Centre for Culture and African Studies, Kwame Nkrumah University of Science and Technology in Kumasi, Ghana, during the 2013-14 year. 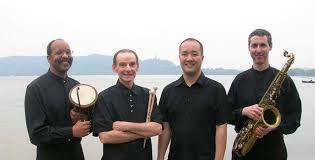 He has performed, given workshops, and recorded internationally with his own blood drum spirit ensemble and master artists (blood drum spirit, 1997 and 2003, Innova; ancestors and blood drum spirit: the Royal Hartigan ensemble live in china, both Innova, 2008), Juba (Look on the Rainbow, 1987), Talking Drums (Talking Drums, 1985 and Someday Catch, Someday Down, 1987) the Fred Ho Afro-Asian Music Ensemble, Hafez Modirzadeh’s Paradox, the David Bindman-Tyrone Henderson Project, Nathaniel Mackey, Michael Heffley, soundSFound Orchestra, Global Phatness, and Paul Austerlitz, among others. He has released a documentary and artistic video of his work in West Africa and its relation to the African American music cultures (eve). Author Kwame 'Write' AidooPosted on January 16, 2015 Leave a comment on UP CLOSE: GET TO KNOW THE BLOOD DRUM SPIRIT ENSEMBLE! Young artists in Ghana are on their prowl! The rise of the influence of internet and technology has brought about a concentration of art works by creatives using digital technology as an essential part of their creative or presentation process. 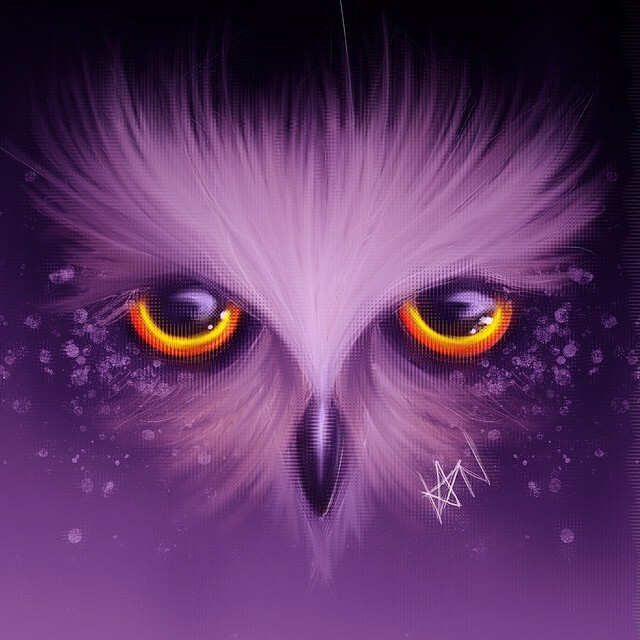 When it comes to digital art genres such as matte painting, digital painting, computer graphics and photo manipulation, one creative worth noting from Ghana is Ian Quhachi! Aside painting, poetry, fashion designing and graffiti, Ian Quhachi (born Ian Kwaku Adomako-Kwakye) keeps a contemporary gallery of a professional blend of colours profuse with intriguing art and some shots from compelling angles from trained lenses that fellow artists and non-artists can appreciate. “My artwork speaks mostly of colours and lights. In my digital arts, I choose random colours and create bright lights, mostly at wrong places to give them an exposed, yet interesting look. Most of my works are related to lights, but I am not obsessed in anyway; I just like the idea of ‘fakelights’ and piercing colours. The concepts I use are mostly drawn from urban arts and the idea of light-and-shadows and line-and-curves. I prefer drawing from the scratch and using my own stuff that I create to manifest a certain level of quality and style-consistency. Although I insist on style-consistency, the particular work in question determines my methodology and outcome. I hate doing posters and other stuffs that restrict or order me. 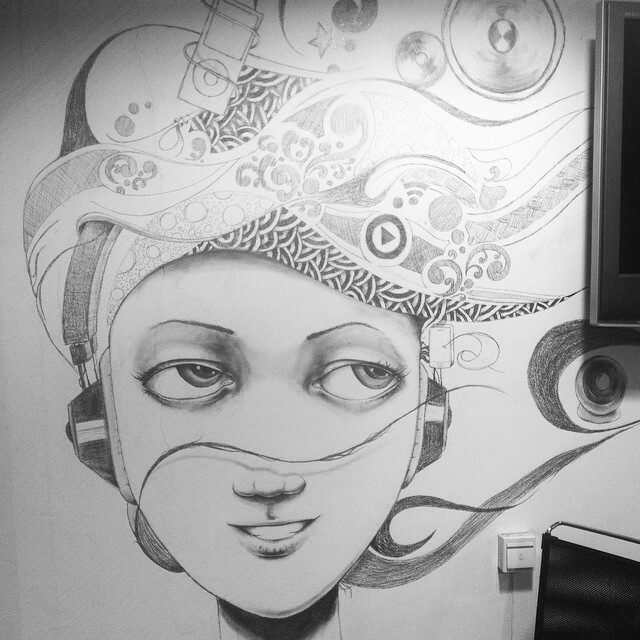 I mostly communicate with the lines and the artwork, so it is annoying if there is a third party. But..um..I personally wouldn’t side with Ian when he goes on to say “I love to draw graffiti… (eventhough there isn’t enough walls in Ghana for such community arts)”. I think there a millions of walls in Ghana that could be used for graffiti art and one doesn’t even need to look hard enough, unless you focus on meeting the standards of locating a purely urban space; where it is difficult to find some free wall or one could be penalized for defacing public or private property. There are lots of walls in the rural and not too rural areas, slum areas inside Accra and at the very outskirts of the capital. Also, one does not have to restrict oneself with the definition of walls. With reference to what Chale Wote 2014 organizers did, by introducing wooden platforms as well as baobab fences as graffiti surfaces. One can build their own walls sometimes even when society says No! Art must survive amidst the blockades and societal polishings. Back to business, Ian is currently working with Coolstuff Grafix of the Coolstuff Extreme Network Co.Ltd. He is as well pursuing a masters degree in entrepreneurship at Kwame Nkrumah University of Science and Technology. Check out his behance (https://www.behance.net/ianx) and tumblr (https://www.tumblr.com/search/Ian+Quhachi). He may be using his pseudonyms Eric Law or Partikles, but the firebrand personality breeds art works which always speak for themselves. During my visits to Togo, I’ve come across many good hip hop artists who are all out with their vocal delivery and lyrical content. Though my understanding of French is only half-baked, I still manage to filter the intrinsic art they serve. Mostly, they perform in duos, with one rapper adlibbing as the other drops bars like alcatraz going loose. Then there’s a seamless switch so the other rapper takes his turn. The industry, as it is the situation in Ghana is male-dominated but the ladies find their way into the audience supporting by large. is one of the best I’ve heard and it builds momentum using oral storytelling and thick proverbial talk to describe the revolutionary struggle of young people in a lost society. Other intriguing artists not to be missed are Balles 2 Rimes, Zalem, Kankua, etc who will feature at tonight’s “Microfiles”. I was at the last Microfilles and I never regretted all that rare fun and jam! With live graffiti by Trez on stage as the mic-grippers dropped knowledge, the eyes and ears were filled with colours and borderless word flow! At the start of the first world war, Togo was seized by the British and France after being colonized by the Germans for long. On February 5, 2005, Eyadéma died of a heart attack after 38 years in power. Shortly afterwards, his son Faure Gnassingbé was named president. Up to 500 people were killed in the political violence surrounding the presidential poll, according to the UN. Around 40,000 Togolese fled to neighbouring countries.This narrow strip of land on Africa’s west coast, has for years been the target of criticism over its human rights record and political governance. Tensions spilled over into deadly violence when the strong-arm, veteran leader died and a succession crisis followed. Political reconciliation remains elusive. Parliamentary elections were held in Togo on 25 July 2013 and they hit the polls for the presidentials in March. On the streets you hear people charge; “For the sake of peace… Faure Gnassingbé should not stand for re-election in 2015.” Artists engulf this unsettling and disorder from the mainstream politics and everyday life and drop it into the mic and canvasses because the truth needs to be told. As observers and spokespeople that’s their work. Many a conscious rapper in Togo needs to be heard! You just heard me play a chord! I met Siaka at one Ehalakasa evening of poetry sharing in Accra; a young man of few words when we discussed his music and the possibility to merge poetry and his tuneful songs played on the kora. Before that, he had stood at one end of the stage strumming away like a god, riding a bull-faced cloud, letting loose rain on an a hot human day. It was just marvelous! I had seen the kora being played several times and spoken to a few instrument makers at the Accra Art Centre about its origin and what people thought of it. First and foremost, you have to know that the Art Centre guys are not the easiest when it comes to information sharing about their works or instruments. Most of the responses I got were that it originated from the Northern parts of Ghana and other Sub Saharan countries and settlers in the lower parts of Ghana brought it down with them for merry-making and occasions just like the gyil. 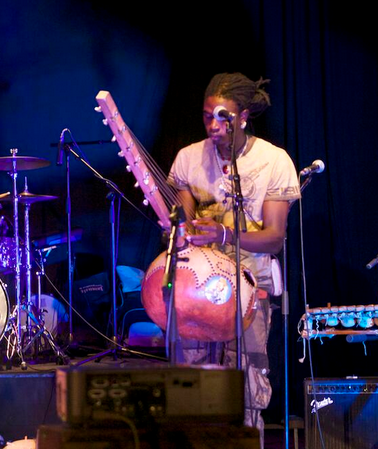 Siaka Diarra is a jali (traditional kora player) and one of the best at it. If you’re lost; a kora is a harp built from a big calabash cut in half and covered with cow/sheep skin to create a resonator. It also consists of a long hardwood neck. The skin is supported by two handles that run under it and a free-standing bridge. It doesn’t fit into any one category of musical instruments, just as Siaka’s music doesn’t sound like any other contemporary African musician’s.